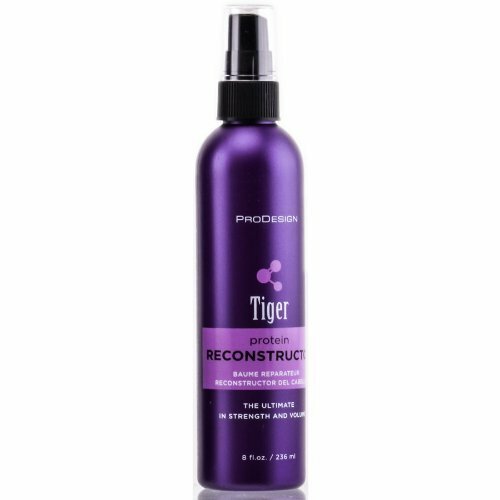 In my Banish Breakage post, I mentioned a little known product by the name of Tiger Protein Reconstuctor. The moment I saw the price tag, I knew I had to have it. To me the high end price probably was related the quality of product. Although I own dozens of hair products. The only thing missing was a super protein leave-in spray. I had no other choice but to get it. When my package arrived, I immediately wanted to try it. But not before I turned the bottle to check out the details. Directions: For Maintenance and Repair Treatment apply & massage into clean, damp hair dry & style as usual. For Maximum Treatment: Apply & Massage into clean, damp hair. Cover with plastic cap & heat for 5 minutes. Remove plastic cap and style as usual. I just love the fact that a spray leave in can be used as an intensive treatment by applying heat. The ingredient list itself contains various types of proteins including soluable keratin, hydrolized wheat protein, hydrolized keratin, wheat amino acids, betaine (we mentioned the amazing benefits this ingredient in a previous post) and much, much more. My first experience was on dry hair. I misted a little on "dirty" hair to see if I would experience stiff, brittle strands. Instead of brittle strands, I experienced stronger hair but without the feeling of protein overload. Mind you, I did layer on some moisture on top of where I misted just to make sure nothing crazy happened. But overall, I was very pleased. The second experience was on wash day. I washed and conditioned as usual then, during the rollerset I sprayed the length of my hair with the leave in. Again, I experienced none of the "heavy protein" feeling that I fear so much. I'm guessing the size of the proteins are small enough to penetrate the strand instead of staying mainly on top of the hair. Hence, my hair still remained it's old self, only stronger. I felt pretty good about using Tiger Reconstructor as a final step during the roller set but this week, I had an ever better idea. Remember my post on using different conditioners during the pre-poo based on how strong or weak the section is? Well, this strengthening spray is perfect for such a scenario. Currently, I have healthy sections and I have weak sections. Weak sections are those that, when manipulated, suffer casualties (broken strands). Strong areas I can detangle without a care in the world. During my pre-poo, whenever I came across a weak area, I sprayed a little bit of the reconstructor into my hand and distributed throughout the section. The reason I misted into my hand was so I can be intentional about where the product goes. I also use less product this way. After applying the reconstructor, I layered some moisturizing Kanechom and moved on to the next section. Once done, I steamed then jumped into the shower to rinse. My breakage in the weak areas reduced dramatically! I'm beyond pleased with the results. I love Babyface Pure Protein for an all over strengthening treatment but this gives me a laser-like focus to target my weakest areas. I also remembered how Yahya mentioned targeting her ends with protein because to aid with retention. I tried that over the weekend and today, my ends feel stronger as a result. This type of product was exactly what was missing from my regimen. Someone, like me, who over manipulates their hair needs a product that can help neutralize my potentially damaging actions. How on earth did I go so long without it? You find the neatest products. It has a little too much proteins for my hair but thanks for sharing and introducing us to new, neat stuff. You should try the Tiger masque, you would LOVE it!! Wow! Nice stuff. I am very glad that I found your blog. hair care products " Keep sharing such kind of useful information. Excellent one. Five Beauty Treatments I do from my Hotel Room. Monday Motivation | Learning to Love the Process.